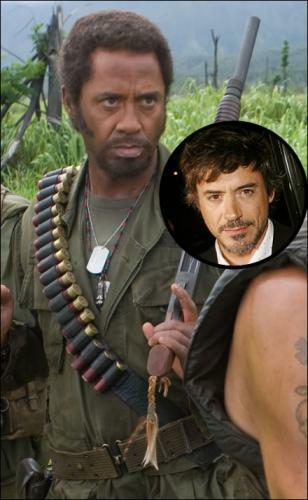 First look at Robert Downey, Jr. in his upcoming movie “Tropic Thunder” with Ben Stiller and Jack Black. C. Thomas Howell ain’t got nuthin on him! That is clearly Downey’s black half-brother; you can’t fool me. I think its Robert Browney, Jr.
I’d pay money to see that in the credits, balls. I’d pay several monies. GREAT reference to C. Thomas Howell! Ah, that crappy “Soul Man” movie! At least Rae Dawn Chong was HOT!